May 5, 2016 May 4, 2016 Dan O. Some gun-slingers are better left dead. 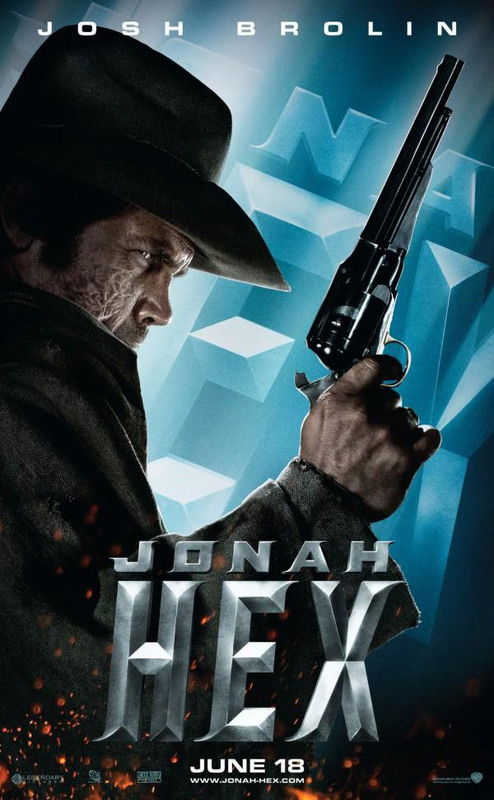 Having cheated death, gunslinger and bounty hunter Jonah Hex (Josh Brolin) has come back from the dead to get revenge on those who wronged him when he was alive and well as a normal, everyday human being. Now, Jonah has certain supernatural powers and skills that allow for him to contact the dead, as well as find out where anybody is in the world. Why? Or better yet, how? Well these are questions that may never, ever get explained. However, while Jonah wants to set out on an adventure of sorts, he’s still considered a traitor by his army, and now, has to make a deal: Stop and kill Quentin Turnbull (John Malkovich) from releasing these super powerful and disastrous explosives on the White House. Obviously because Turnbull killed his wife and son while he was alive, Hex has no problem with this, but he also knows that he’s going to have to get in contact with the dead an awful lot to ensure that he completes his mission, and doesn’t end up hanging out with some of those that he himself has killed. There are two parts of me sitting here thinking about Jonah Hex. The one part of me wants to be a very smart, thought-provoking and serious movie critic who looks at Jonah Hex as a pile of messy, over-edited and jumbled-up drivel that the studio had absolutely no faith in, so therefore, they just dumped it out to see what could happen. That’s very obvious from the very beginning, to the fact that the movie itself is barely even 81 minutes (end credits included). Someone had the bright idea to make Jonah Hex, but the studio themselves soon regretted that decision and were left with a huge mess on their hands, so, they did what they could, given the tornado they were working with. Then, there’s the other part of me that enjoys a good movie, even when it’s awfully bad. And yes, Jonah Hex is that kind of movie. I think what surprised me the most about Jonah Hex, other than how it got green-lit and was a viable enough option for some of these talented, respectable actors to actually sign up for it, was just how weird and off-putting it is, even for something that was released to over 2,000 theaters in the dead heat of the summer season. It’s not a particularly pretty movie, nor is it a very depressing one, either. There’s jokes and odd sight-gags galore, but when you really look deep and down inside of the story, you’ll realize that it’s pretty damn dirty and disgusting. Then again, maybe it needed to be. After all, the actual stories of Jonah Hex, from the graphic novels and whatnot, aren’t particularly lovely stories of inspiration and human wisdom, either; they mostly all just feature Hex himself, going out there in the wild West, taking down some evil-doer, drinking booze, saying some witty things, contacting the dead, and that’s basically it. They’re not ground-breaking, or even life-changing stories; they’re just perfect little pieces of pleasure to sit by and read for a little bit of time. That’s why the movie of Jonah Hex, despite it not being the greatest thing ever made, matches what the comic books actually set out to do: Give us a sense of who this character is and the world in which he exists in. And the world in which he lives in, despite also being placed in some sort of odd reality, is a pretty screwy and weird one – the likes I’ve hardly ever seen of a big-budgeted, mainstream picture, but more of a low-budget, indie Acid western. If I had to wake up to that every morning, uh, yeah, I’d be pretty fine. But then again, yes, the movie isn’t really “good”, by any stretch of the imagination. Director Jimmy Hayward and writers Neveldine/Taylor may have been fine choices for this material in the first place, if they were working on it separately, without the other’s influence anywhere to be found, but together, it’s an absolute cluster f**k of something I’m still trying to make sense of. Hayward is a competent enough director to where he allows for action-sequences to play out in an understandable manner, but Neveldine/Taylor can’t stop allowing themselves to take all of the havoc one step further, and Neveldine/Taylor are good at creating crazy situations and letting them all play out, but Hayward himself still wants to keep some of the material grounded in at least some sense of reality. Apart from one another, they’re probably great for this kind of material, but together, they overstep one another too much to where you wonder just whether or not these two actually did beat the heck out of one another backstage. That said, it’s very hard to be bored from Jonah Hex, if you’re looking at it from a strictly film-goer’s point-of-view. The movie does try to take itself seriously, but then a scene later, will decided not to and try to pick up its pieces; the performances are so over-the-map to where you’ll get a brooding, almost subdued Josh Brolin, to having a wildly violent, overly insane villain like Michael Fassbender’s, who even loves the taste of his own blood; the action-sequences themselves are so wild, that it’s hard to figure out who is who, and where; and if that wasn’t odd enough, the whole movie is scored to some sort of mix metal rock opera that makes you think Led Zeppelin got together with the National Youth Orchestra. Overall, it’s a very odd duckling of a movie, but it was hard for me not to have fun by how ridiculous it can be. It’s not good by any means, but sometimes, you have to rip-off your critic hat and just let some crazy things work their magic. Even if they’re magic is hard-to-define. Consensus: Jonah Hex is over-the-top, uneven, messy and just plain weird, but there’s some charm to be found in that, especially when it’s just accepting itself for what it is, which is a crazy acid western that was somehow made for a lot of money and caught big names to it. Heh. No wonder it bombed. Uh oh. You’ve gone and done it now. Couldn’t get into this movie at all, for the same reasons you give. It’s just a complete and total mess. Great review, Dan. I despised this thing. Was actually the ONLY person in the theater watching it. Sad thing is there is a ton of potential in the source material.